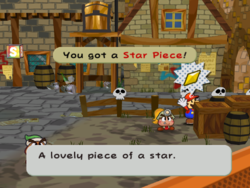 Star Pieces are collectible items in the Paper Mario series. They are found in hidden locations throughout the games, and some are even found underground, in which case a Spin Jump or Mario's Ultra Hammer is used to collect them. Star Pieces can be used to trade for various badges. There are 160 in Paper Mario and 100 in Paper Mario: The Thousand-Year Door. In Paper Mario, they are used for trading with Merlow for badges. 64 of the 160 pieces in this game are held by Chuck Quizmo. In Paper Mario: The Thousand-Year Door, they are used for trading with Dazzle in Rogueport Sewers. The fortune teller Merluvlee can tell Mario where the star pieces are. 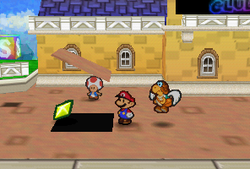 Mario revealing a Star Piece with his Ultra Hammer in Toad Town. In Paper Mario, Star Pieces are scattered throughout the Mushroom Kingdom, and collected by characters and used for trading too. Characters also give them to each other as thank-you gifts, usually for returning or giving an item wanted. Goombaria mentions that they are good-looking ("Look at the pretty glitter! "), which implies that characters collect them because they look good. Kolorado also mentions that when he found a Star Piece when searching Dry Dry Ruins he immediately picked it up. Mario can also collect them, but the only practical use in the game is to trade badges from Merlow. There are just enough collectible Star Pieces to buy all the badges Merlow offers. The player can check the numbers of Star Pieces collected so far on a board in Mario's House, and the number in possession on the pause menu. The in-game description is: "It's a glowing Star Piece! Wait and see what this is for." 4 are used as rewards for giving or returning items: Goombaria's Dolly, Russ T.'s Dictionary, the Postmaster's Mailbag, and the Artifact for Kolorado. 11 more are used as rewards for letter delivery. The characters who give a Star Piece when receiving a Letter are Fice T., Goompa, Igor, Kolorado, Mayor Penguin, Merlon, Merlow, Minh T., Mort T., Russ T. and the Nomadimouse. Some of the overworld Star Pieces are underground. These need at least Super Boots or Ultra Hammer to get. When performing a Spin Jump, Tornado Jump, or an Ultra Hammer smash around it, a square panel from the ground flips, and the Star Piece pops out. However, if jumped or smashed right above, the panel will only shake without popping out the Piece. These Star Pieces' existence is hinted by a Boo that appears in the room where Mario gets the Super Boots. They can be detected by the I Spy Badge. Merluvlee, who lives in a house near Shooting Star Summit, can give predictions of the whereabouts of the Star Pieces. She can predict only the overworld 63. If the player hasn't collected any Star Pieces yet, the menu description says, "Wondering what this is for? Secret!" Mario collecting a Star Piece behind a set of crates in Rogueport's plaza. In Paper Mario: The Thousand-Year Door, there are 100 collectible Star Pieces, among which 98 are overworld and two are owned by characters. Some of overworld ones are underground and require Super Boots to get. The difference is that in the sequel, the underground panels can no longer be flipped with the Ultra Hammer. The last two are owned by Chef Shimi and the Excess Express waitress, respectively, and will be given to Mario for fulfilling the corresponding requests. Mario can still use Star Pieces to trade for badges. All 100 Star Pieces are needed to get all of Dazzle's badges. Merluvlee can predict the locations of the Star Pieces for five coins, and Ms. Mowz can detect them for Mario using her field ability (by pressing ). The number of Star Pieces Mario has collected is displayed on a notice board near the entrance of the Pit of 100 Trials. The in-game description is: "A lovely piece of a star." At the end of Paper Mario, when Mario is going to attend Princess Peach's party, it seems that the developers didn't want to let the player collect any more items by closing all the facilities in Toad Town, but they left the Star Pieces in Toad Town unchanged, so the Star Pieces are the only items Mario can collect at this time. Star Pieces look very similar to Revives from the Pokémon franchise. This page was last edited on November 2, 2018, at 13:55.